The advent of breathable waders a couple of decades ago has helped to make the majority of our wader-adorned fishing experiences much more enjoyable. Gone are the days of vulcanized rubber and neoprene waders that were effectively like fishing in a really heavy-duty trash bag—waterproof but uncomfortable. However, wearing incorrect layers under your breathable waders can result in a similar experience, even with today’s high-tech breathable fabrics. By wearing the correct types of garments under your waders, you can stay warm and comfortable through out the day and ensure you stay on the water longer. Let me start by dispelling one common myth. Breathable doesn’t mean air-conditioned. You will sweat in breathable waders, and not all of this sweat is going to “breathe” out of your waders. This is especially true if your fishing adventure includes any strenuous activity, like hiking, or you naturally sweat abundantly. So what happens to the sweat that is left in your waders? That is where proper layering becomes an important factor. Not only do the correct garments help to insulate, which is very important, but they also serve to manage excess moisture that can and will accumulate inside your waders. Improper fabrics in your layering system can contribute to making you cold, clammy and just basically uncomfortable. So what should you wear? I’ll break it down into three basic temperature ranges and provide a detailed list of the type of garments that you should consider wearing. You may already own some of these garments if you hunt, ski, hike, or do any other outdoor activity in a wide range of temperature conditions. There is one common element throughout all these systems—no cotton! Most of us wear cotton every day and enjoy the overall comfort. However, under waders, cotton garments will work against you, as they are highly hydrophilic (water-loving) and have no insulative value when wet. Try and avoid cotton at all cost, especially in cold conditions. During the coldest part of the year, temperatures will generally range between 0 and 40 degrees, depending on your specific geographic region. There are two major priorities—keeping warm and staying completely dry, which aids tremendously in keeping warm. Feet—An important thing to remember is that the neoprene booties on your breathable waders don’t breathe at all, and feet usually sweat a lot. In cold temperatures, this excess sweat will do its best to make your feet damp and cold, driving you back to the warmth of your vehicle much earlier than anticipated. Therefore, you’ll need a two-sock system. Start with a 100% synthetic “liner” or lightweight sock, usually constructed of a poly/nylon blend with some spandex for a comfortable fit. These socks will help to ensure that any moisture generated is wicked away from the skin. Over this sock goes a midweight or heavyweight insulatiing wool/nylon blended sock for warmth. 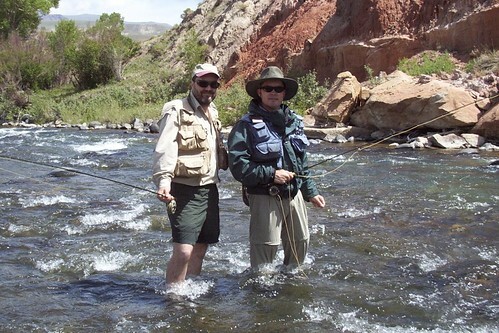 Keep in mind that you don’t want to create too much bulk that results in your wading boots being too tight. When this happens, you effectively cut of the blood supply to your feet, and they will get cold no matter what you wear. If you fish often in the winter, consider purchasing another pair of wading boots in a larger size to accommodate the added bulk or use a bootfoot wader. Body—The same principle applies here as with the feet. Start with a midweight layer that is extremely efficient at moving moisture away from the skin. Synthetics and wool/synthetic blends are great choices. The next layer is your insulating layer, and fleece is your best option. Midweight or heavyweight fleece pants or a suit will fit the bill for this task. In extreme cold, I have been known to wear two fleece layers, but you have to consider how your waders are going to fit with all that bulk. temperatures can vary widely, proper layering is critical. Temperatures will range from near freezing to a very comfortable 65+ degrees, so flexibility and layering is the key. Staying warm is still an issue, but the warmer temps make moisture management a higher priority. Feet—The two-sock system is still ideal, but as temperatures warm it may be unnecessary. A single, good synthetic wool-blend heavyweight or midweight sock may be more than enough to keep your feet warm and dry during this transitional season. Body—Moisture management will become more of an issue as temperatures increase, but you will still need to make sure you have enough insulation. A lightweight synthetic or wool/synthetic blend is a great base layer and will effectively manage the potential increase in perspiration. A fleece pant is a perfect choice as a thermal layer. Many of these pants incorporate a certain amount of stretch material to help achieve a better fit and offer unrestricted movement and flexibility. I have never called it quits for the day because I was too warm, so be prepared during this unpredictable but productive part of the fishing season. to keep your skin covered for sun protection. Temperatures will range from 70 to 100, so moisture management is the top priority. But don’t neglect the insulation component, especially if your favorite haunts happen to be on tailwater fisheries where water temperatures are often in the 40s. Feet—A good all synthetic or blended lightweight sock is a perfect choice. The temptation during this time of year is to throw your waders on over the cotton socks you wear on a normal day, a guaranteed way to have wet and uncomfortable feet. The same wading boots that fit perfect in winter may now feel loose and sloppy; you may consider having a second pair for warm weather fishing. Body—A lightweight synthetic base layer is the perfect warm-weather layer. Wear alone or as a first layer on cooler days, as it will wick moisture away from the skin and dry fast to keep you comfortable. Many offer some level of antimicrobial treatment to eliminate odor and bacteria growth, which can be a factor in hot, humid conditions and on multiple-day trips. Avoid the temptation to put on waders over jeans or chinos, as the cotton fibers will act as a sponge and soak up all your perspiration. In some cases, this could produce enough moisture to give the impression that your waders are leaking. 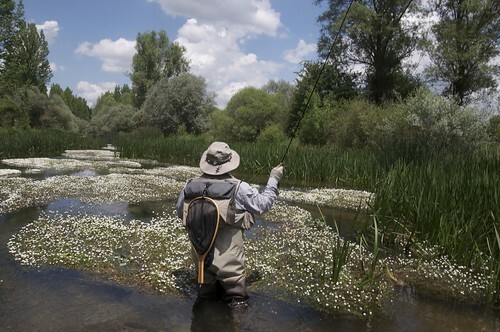 These are some very basic guidelines to help you get started in determining what to wear under your waders. Your own personal comfort level and internal thermostat will help to fine-tune this to meet your expectations. This entry was posted in FISHING, Flyfishing, Gear.